As part of a tenant search done co-exclusively on behalf of the group Carlyle, analyse the possibilities presented by the project, recommend and carry out a marketing plan coherent for the 5 lots with a total surface area of 3,300m² situated at the foot of a magnificent building currently being restructured. The building consists also of 17,000m² of commercial executive offices. Draco Partners approached companies whose activities could be adequate with the high requirements of the Landlord, the unique architectural quality of the building and also the importance of the lots and the coherence together. 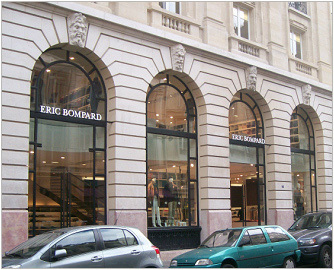 Draco Partners succeeded in the signing of a 12 year leases with the brand Eric Bompard, the ready-to-wear brand which specialises in cashmere, who had decided to transfer their existing store of rue du Bac, to open in this building their 2nd Flagship store of 400m² in Paris, the same concept as the Champs Elysées.